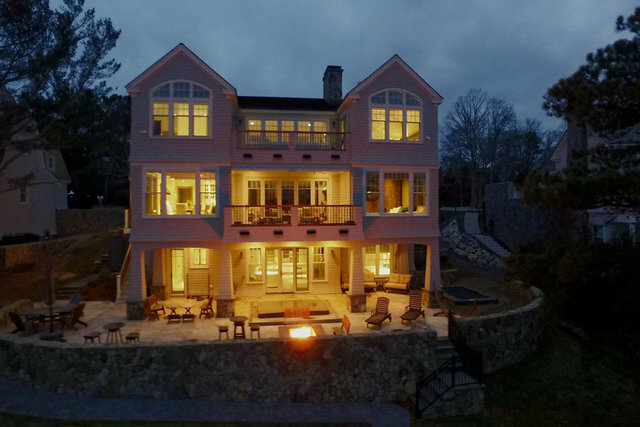 Spectacular custom built home with deep water dock located in New Seabury. This home was built in 2015, featuring an open floor plan on the first floor, gourmet kitchen with high end appliances including a 30'' gas pizza oven, granite counters, eat-in kitchen, entertainment room with stone wood burning fireplace, large nano door opening to screened porch and water views, office, guest suite, pantry, two car garage. On the Second floor there is a master suite that includes aroma therapy hot tub, tiled walk-in shower, heated floors, gas fireplace, water views, two additional bedrooms with en-suite baths, and laundry. The lower level is also finished and features a bonus room, 10' ceilings, TV room with gas log fireplace, and steam/radiant spa. Other main features include 3 level elevator, full handicap accessibility, 2 generator systems, and hot tub.